The Lady of the Rivers is the third novel in Philippa Gregory’s Cousins at War trilogy, covering the stories of three of the women involved in the Wars of the Roses. The first novel, The White Queen, was about Elizabeth Woodville, Edward IV’s Queen Consort; the second, The Red Queen, covered Margaret Beaufort, mother of the first Tudor king, Henry VII. Now in The Lady of the Rivers we go back in time to the story of Elizabeth’s mother Jacquetta, firstly Duchess of Bedford, and then following the death of her husband, she marries Richard Woodville who becomes the first Earl Rivers. The Wars of the Roses is a fascinating and complex time in English history. The houses of Lancaster and York fought each other for the throne, which changed between them a few times. Henry VI was the Lancaster king when The Lady of the Rivers begins, but due to his ineffectual rule and the influence of his wife, the Duke of York fought to have the right to advise the king, and later his son, who became Edward IV, fought to win the throne itself. Jacquetta was staunchly Lancastrian – born into the Luxembourg royal family, she married the Duke of Bedford at a young age, and was influenced by his unwavering loyalty to Henry VI. Her second husband Richard served the Duke of Bedford and is equally loyal. Jacquetta became a close friend of Margaret of Anjou, Henry VI’s Queen, and stuck by her despite her misgivings about Margaret’s choices and actions. Gregory’s historical novels are almost always exciting, and this is no exception. Simply reading the history of the Wars of the Roses is exciting, so to novelize that history and fictionalize dialogue adds a personal element to a well-known tale. Her research is excellent, and her novels are historically accurate wherever possible, and The Lady of the Rivers is no exception. All notable events are present and correct, and details which are not conclusively known tend to be based on the most likely event. Jacquetta’s family was purported to be descended from the water goddess Melusina, and the women had powers of foretelling and magic. This was examined in The White Queen, as it was alleged that Elizabeth Woodville was a sorceress, and of course there is more of this aspect of the story in The Lady of the Rivers. Gregory’s style is engaging and easy to follow – although these novels are set in a time far removed from ours, she makes her stories easy for modern readers to engage with. Her style is not modern, but is suited to the time period, yet is still clear. In The Lady of the Rivers, Gregory has chosen a fascinating and sympathetic character in Jacquetta. The same was true of The White Queen, but this was missing somewhat in The Red Queen – although Margaret Beaufort was fascinating, she is not someone it is easy to like or have sympathy for. Jacquetta and her daughter Elizabeth make much more likeable characters. The Lady of the Rivers ends where The White Queen began, with Elizabeth having met Edward IV. Each novel has taken a small step further back in time, with The Red Queen starting earlier than The White Queen, and The Lady of the Rivers taking a step further back as well. One effect of this is that it gives the reader more knowledge than the characters – when Jacquetta meets a young Margaret Beaufort, we know Margaret’s fate while Jacquetta can only wonder. Similarly, Jacquetta sees a great future for her daughter, but cannot be sure what it is – while of course we the reader know that Elizabeth will become Queen. While I enjoyed this foreknowledge, which was also based on my own knowledge of the history, you could actually read the trilogy backwards, starting with The Lady of the Rivers, to avoid knowing what is going to become of everyone! 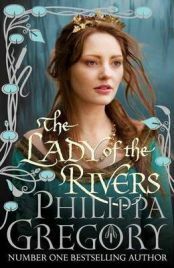 The Lady of the Rivers is a thoroughly enjoyable read, and a must for all fans of Philippa Gregory. Future subjects may include Elizabeth of York, daughter of Elizabeth Woodville and Edward IV, and mother of Henry VIII, and the Neville women, daughters of the “Kingmaker” Richard Neville – whatever her next subject, I thoroughly look forward to Gregory’s future novels. Many thanks to Simon & Schuster for providing a review copy of The Lady of the Rivers. No Comments on "The Lady of the Rivers"